*Information Sources: The Cooperative Extension Service College Of Food And Natural Resources, U.S. Department Of Agriculture, Massachusetts Counties Cooperating. What Is The Life Cycle Of Eastern Subterranean Termites? How Do Termites Cause Damage? Are relatively common pests which can cause structural damage to houses if left uncontrolled. Termites infest more than 600,000 homes each and every year, causing more damage than fires, storms or earthquakes — an estimated $2 billion in the United States alone. There are many species of termites, but only the Eastern Subterranean Termite is discussed here, which is the most common and widely distributed termite in North America. They occur South of the line where the average annual minimun temperature is -22F (30C.) This includes Southern Ontario, Canada through the Eastern United States and into Texas. Termites remain inconspicuous most of the year, attacking / feeding on wood, but each spring large numbers may be seen swarming on sides of houses or in basements or even on carpeting. These swarmer termites are winged, but the wings are very loosely attached and knock off easily. Often a pile of wings is the first hint of a termite infestation. Each termite has a small, unicellular protozoan living inside of it that enable it to digest wood and other food. Without this symbiont, termites would not be the pests that they are today. The small protists can break down the main substance present in most plants. Even though the termites plague the human civilization, they are imperative to the natural process of decomposition in nature. Termites can help to replenish the soil and get rid of fallen trees and leaf debris. These protozoa are present in in all termites except one termite family which has evolved a symbiotic relationship with bacteria and fungi. Winged termites (reproductives) are black, about 1/8 inch long, and resemble ants. However, termites do not have the narrow “waist” so typical of ants. Termite antenna? (“feelers”) are made up of many beaded segments; whereas ant antenna? have one very long segment nearest the head and then many smaller segments. Both termites and ants have 2 pair of wings. However, the front and hind wings of termites are very similar in size[actual termite swarmer] and shape with fine, indistinct veins. In contrast, the front wings of ants are noticeably larger than the hind wings and the wings usually are tan or brown with a few distinct veins. 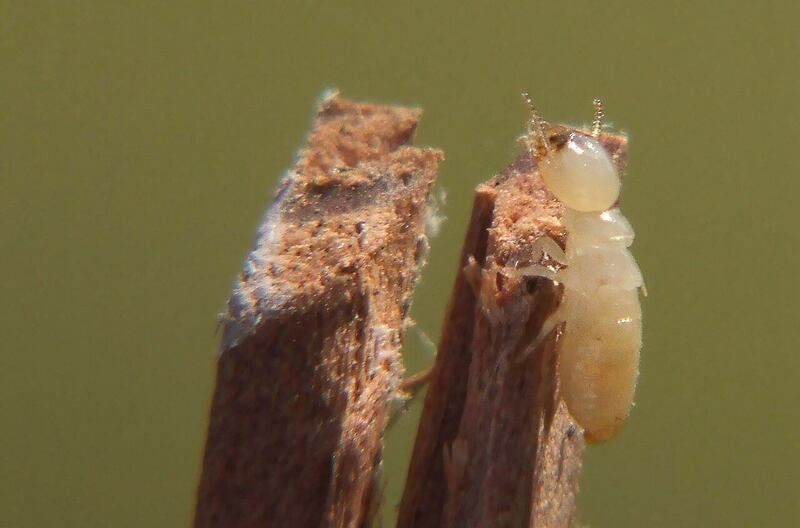 The chance to see winged termites occurs once in the early spring and sometimes in early fall. At other times of the year the termites will not be readily visible. If an active mud tub or infested piece of wood is broken open, the termites in most cases will not be winged, & their color tone will be various shades of white, brown and red. Are social insects with distinct castes. Nests are started by a mating pair of swarmers. After constructing a small sheltered nest, the queen will lay her first batch of eggs. Both male (king) and female (queen) care for the first initial generations of immature termites. As the colony grows, the nest will be moved deeper into the soil and expand. Termite colonies usually require 3 to 4 years before they produce their first swarmers. During this time damage to the structure is usually limited. Once mature, termite colonies may contain thousands of insects & damage to structures progresses quickly. A typical mature colony may contain 60,000 to over a million workers. In a typical termite colony, the king and queen are the only active reproductives; they perform no other function. They are fed by the other termites, and some have lived up to 25 years. A mature queen can lay thousands of eggs each year. 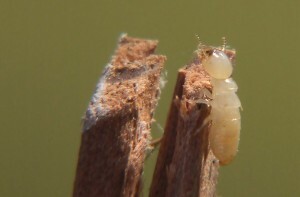 During the two-week incubation period, eggs are tended by the worker termites. The nymph hatches directly from the egg. Attendants feed nymphs regurgitated food for the first two weeks, enabling them through molting to become workers, soldiers, reproductives, or supplementary reproductives. As the reproductive nymph matures, its body lengthens and sexual organs develop. The body turns black, eyes become functional, and wings extend twice its body length. The worker nymph has no eyes and is sterile. Its main function is to provide the colony with food, usually obtained by eating the understructure of buildings. The soldier nymph develops a long, armored head and large jaws during its last molt. The sole purpose of the soldier is to defend the colony against enemies such as ants. All mature reproductives leave the colony at the same time, usually in the spring and sometimes in the fall. Swarmers are poor fliers and, when above ground, usually flutter a few yards and fall. Swarmers, emerging outdoors from tree stumps, railroad ties, etc., are usually not of concern and are in no way an indication that the structure is infested. After dropping to the ground, they shed their wings. Surviving males find compatible mates and then burrow into the ground to become king and queen. Subterranean termites feed exclusively on wood and wood products containing cellulose. Termites have protozoa (microorganisms) in their intestines that provide enzymes to digest cellulose. Although termites are soft-bodied insects, their hard, saw-toothed jaws work like shears and are able to bite off extremely small fragments of wood, a piece at a time. Termites often infest buildings and damage lumber, wood panels, flooring, wallpaper, paper products and fabric made of plant fibers. The most serious damage is the loss of structural strength. Other costly losses include attacks on flooring, carpeting, art work, books, clothing, furniture and valuable papers. Subterranean termites do not attack live trees. Termites are surprisingly mobile and can gain access to wood in virtually any part of a building. However, most colonies build nests underground initially, so original infestations usually are found around the foundation and lower floors. Termites can slip through tiny cracks in cement foundations. Virtually any type of construction or foundation is susceptible to attack. Buildings with wood in direct or close contact along the ground are more apt to be attacked. Subterranean termites usually damage wood with the grain. 60,000 workers can eat 1/5 ounce or 5 grams of wood each day. At this rate, such a colony could completely consume 2 1/3 linear feet of a 2″ by 4″ pine board in one year. There could, however, be several colonies infesting a single building. When a termite infestation is suspected, it is advisable to have the insects identified by your county Cooperative Extension Service, a pest control operator or a home inspector experienced with wood boring insects. If possible, locate the point of entry. Sometimes the mud-covered shelter tubes can be seen along the side of the foundation. In most cases, points of entry are less obvious. Usually it’s recommended that a professional pest control operator be called to conduct a thorough investigation. Termite inspections / treatment estimates usually are conducted for a nominal fee. Are best handled by a professional pest control operator. Most treatments will cost between $1400 and $2000. The standard practice for termite control involves the injection of an insecticide into the ground around the outside foundation and around the interior perimeter footing of the building. This method forms a chemical barrier which prevents the termites from moving into the building from their nesting site. When done correctly the technique is safe and effective. Registered chemicals are designed to stay in the soil where applied and risk of exposure to resident is very small. There are other methods, including baiting, for termite control which your pest control operator can discuss with you. If for various reasons (proximity of a well, high water table, proximity of a waterway) soil treatment is unacceptable, discuss the alternatives with a pest control operator and /or your Cooperative Extension Agent. Reminder: Do not plant edible crops within 10 feet of ground treated for termite control. Replace all damaged wood (if the wood is near the ground use pressure treated lumber) & eliminate sources of moisture, since termites prefer wood with a moderate moisture level. A note of caution: Do not panic. Termites are damaging, and cause substantial structural damage, but they will not destroy a house overnight. Do not rush into a quick, incomplete termite control job. Take the time to talk with two or three pest control operators, obtain estimates, and select the one you think best meets your needs. If you have a question about termites or termite control or need a non-bias termite inspection, call 978-478-7183 or contact Evan Robitaille at Able Home Inspection. The fee charged by Able Home Inspection for a termite Inspection performed with a home inspection is usually $95. (Fee may vary depending upon the size of the property inspected.) Without a home inspection the fee is $125 plus travel fees.